Senator Brian Burston admitted to smearing blood on Senator Pauline Hanson’s door following a brawl with one of her aides. AUSTRALIAN POLICE ARE investigating a brawl between a senator and a top aide that left blood on the walls of the country’s parliament. Police and parliamentary authorities are looking into an altercation between 70-year-old Senator Brian Burston and a staffer for populist Senator Pauline Hanson on Tuesday. 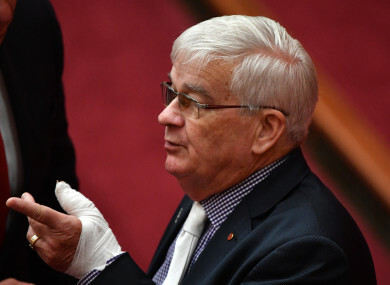 Burston showed off a cut on his thumb following the altercation and, following an initial denial, admitted to smearing his blood on Hanson’s parliamentary office door. In a statement, Burston said he “reported the full matter to the Australian Federal Police” and was asking for a restraining order against the aide. “This matter is now in the hands of the police,” he added. Senator Brian Burston admits it was his blood smeared on Pauline Hanson's office door in Parliament House. Aide James Ashby – who had been instrumental in Hanson gaining outsized influence in Australian politics – has been banned from parliament. The confrontation, which was caught on camera, took place as Burston accused Hanson of years of unwanted sexual advances and Hanson accused an unnamed senator – believed to be Burston – of sexual misconduct. Hanson, leader of the One Nation party, made light of the harassment allegations by saying she was 64 years-old but “not that desperate”. Email “Australian police probe parliament brawl involving 70 year-old senator who left blood on rival's door”. Feedback on “Australian police probe parliament brawl involving 70 year-old senator who left blood on rival's door”.